A treadwheel crane (Latin magna rota) is a wooden, human powered, hoisting and lowering device. It was primarily used during the Roman period and the Middle Ages in the building of castles and cathedrals. The often heavy charge is lifted as the individual inside the treadwheel crane walks. The rope attached to a pulley is turned onto a spindle by the rotation of the wheel thus allowing the device to hoist or lower the affixed pallet. The Roman Polyspaston crane, when worked by four men at both sides of the winch, could lift 3000 kg. In case the winch was replaced by a treadwheel, the maximum load even doubled to 6000 kg at only half the crew, since the treadwheel possesses a much bigger mechanical advantage due to its larger diameter. This meant that, in comparison to the construction of the ancient Egyptian pyramids, where about 50 men were needed to move a 2.5 ton stone block up the ramp (50 kg per person), the lifting capability of the Roman Polyspaston proved to be 60 times more efficient (3000 kg per person). There are two surviving reliefs of Roman treadwheel cranes, the Haterii tombstone from the late first century AD being particularly detailed. For larger weights of up to 100 t, Roman engineers set up a wooden lifting tower, a rectangular trestle which was so constructed that the column could be lifted upright in the middle of the structure by the means of human and animal-powered capstans placed on the ground around the tower. Generally, vertical transport could be done more safely and inexpensively by cranes than by customary methods. 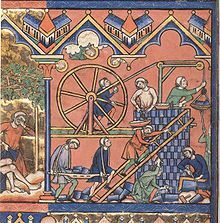 Typical areas of application were harbours, mines, and, in particular, building sites where the treadwheel crane played a pivotal role in the construction of the lofty Gothic cathedrals. Nevertheless, both archival and pictorial sources of the time suggest that newly introduced machines like treadwheels or wheelbarrows did not completely replace more labor-intensive methods like ladders, hods and handbarrows. Rather, old and new machinery continued to coexist on medieval construction sites and harbours. Contrary to a popularly held belief, cranes on medieval building sites were neither placed on the extremely lightweight scaffolding used at the time nor on the thin walls of the Gothic churches which were incapable of supporting the weight of both hoisting machine and load. Rather, cranes were placed in the initial stages of construction on the ground, often within the building. When a new floor was completed, and massive tie beams of the roof connected the walls, the crane was dismantled and reassembled on the roof beams from where it was moved from bay to bay during construction of the vaults. Thus, the crane ‘grew’ and ‘wandered’ with the building with the result that today all extant construction cranes in England are found in church towers above the vaulting and below the roof, where they remained after building construction for bringing material for repairs aloft. In contrast to modern cranes, medieval cranes and hoists - much like their counterparts in Greece and Rome - were primarily capable of a vertical lift, and not used to move loads for a considerable distance horizontally as well. Accordingly, lifting work was organized at the workplace in a different way than today. In building construction, for example, it is assumed that the crane lifted the stone blocks either from the bottom directly into place, or from a place opposite the centre of the wall from where it could deliver the blocks for two teams working at each end of the wall. Additionally, the crane master who usually gave orders at the treadwheel workers from outside the crane was able to manipulate the movement laterally by a small rope attached to the load. Slewing cranes which allowed a rotation of the load and were thus particularly suited for dockside work appeared as early as 1340. While ashlar blocks were directly lifted by sling, lewis or devil's clamp (German Teufelskralle), other objects were placed before in containers like pallets, baskets, wooden boxes or barrels. It is noteworthy that medieval cranes rarely featured ratchets or brakes to forestall the load from running backward. This curious absence is explained by the high friction force exercised by medieval treadwheels which normally prevented the wheel from accelerating beyond control. According to the "present state of knowledge" unknown in antiquity, stationary harbour cranes are considered a new development of the Middle Ages. The typical harbour crane was a pivoting structure equipped with double treadwheels. These cranes were placed docksides for the loading and unloading of cargo where they replaced or complemented older lifting methods like see-saws, winches and yards. Two different types of harbour cranes can be identified with a varying geographical distribution: While gantry cranes which pivoted on a central vertical axle were commonly found at the Flemish and Dutch coastside, German sea and inland harbours typically featured tower cranes where the windlass and treadwheels were situated in a solid tower with only jib arm and roof rotating. Dockside cranes were not adopted in the Mediterranean region and the highly developed Italian ports where authorities continued to rely on the more labor-intensive method of unloading goods by ramps beyond the Middle Ages. Unlike construction cranes where the work speed was determined by the relatively slow progress of the masons, harbour cranes usually featured double treadwheels to speed up loading. The two treadwheels whose diameter is estimated to be 4 m or larger were attached to each side of the axle and rotated together. Their capacity was 2–3 tons which apparently corresponded to the customary size of marine cargo. Today, according to one survey, fifteen treadwheel harbour cranes from pre-industrial times are still extant throughout Europe. Some harbour cranes were specialised at mounting masts to newly built sailing ships, such as in Danzig, Cologne and Bremen. Beside these stationary cranes, floating cranes which could be flexibly deployed in the whole port basin came into use by the 14th century. A treadwheel crane survives at Chesterfield, Derbyshire and is housed in the Museum. It has been dated to the early 14th century and was housed in the top of the church tower until its removal in 1947. It was reconstructed in the Museum for its opening in 1994. A treadwheel crane survives at Guildford, Surrey, United Kingdom. It dates from the late 17th or early 18th century and formerly stood in Friary Street. It was moved in 1970, having last been used ca. 1960 to move materials for Guildford Cathedral. It is a Scheduled Ancient Monument and a Grade II* listed building. A treadwheel crane survives at Harwich, Essex, United Kingdom. It was built in 1667 and formerly stood in the Naval Yard. It was moved to Harwich Green in 1932. The crane has two treadwheels of 16 feet (4.88 m) diameter by 3 feet 10 inches (1.17 m) wide on an axle 13 1⁄2 inches (340 mm) diameter. It is the only double wheel treadwheel crane in the United Kingdom. The crane is a Grade II* listed building. A reconstruction of a 13th-century treadwheel crane can be seen in action at the site Guédelon Castle, Treigny, France. It is used for lifting mortar, rubble, ashlar blocks, and wood. The object of Guédelon Castle is to build a fortress castle using only the techniques and materials of 13th-century medieval France. A treadwheel crane or 'squirrel cage' at Guédelon Castle. Gdansk Crane (Polish: Żuraw) (German: Krantor) was built before 1366. It was destroyed by the soviet troops during the fighting for the city in early 1945. The brick structure survived, the wooden parts have been restored. A reconstruction of a double wheel treadwheel crane is in use at Prague Castle, Czech Republic. A Treadwheel Crane was used in the film Evan Almighty, when Evan complained to God that he needed a crane to construct the Ark in suburban Washington, D.C.
^ Matthies 1992, pp. 525f. ^ Matthies 1992, pp. 532ff. ^ "THE TREADWHEEL CRANE, MILLBROOK (west side), GUILDFORD, GUILDFORD, SURREY". English Heritage. Retrieved 28 October 2009. ^ "Treadwheel Crane". The Harwich Society. Retrieved 28 October 2009. ^ "OLD NAVAL YARD CRANE, HARWICH GREEN, HARWICH, TENDRING, ESSEX". English Heritage. Retrieved 28 October 2009. ^ "Man-powered medieval crane at Prague Castle". Radio Praha. Retrieved 28 October 2009. This page was last edited on 6 March 2019, at 19:35 (UTC).